The parent company of the New York Stock Exchange has been working on an online trading platform that would allow large investors to buy and hold Bitcoin. The blockchain space has generated a lot of hype about how it can improve the lives of its users, and how it might positively impact society. Unfortunately, it has produced very little discussion about the harms (accidental or deliberate) that can arise from the use and abuse of blockchain technology. Argentine entrepreneur Wences Casares has spent the past several years persuading Silicon Valley millionaires and billionaires that Bitcoin is the global currency of the future, that they need to buy some, and that he’s the man to safeguard it. Now his startup, Xapo, has built a network of underground vaults on five continents holding around $10 Billion in Bitcoin. I doubt Warren Buffett and Charlie Munger will read this post. But if they do, the one thing I would hope they take from it is that instead of disparaging crypto assets with words like “rat poison” and “dementia,” they take a little bit of time to understand what we are seeing here. On this episode, thought leaders Kyle Samani and Tushar Jain, describe why they don’t think the technology that a team develops early on will play nearly as big a role as some think, why there will be a spectrum of blockchains offering different features with different tradeoffs, and why they’re bearish on stablecoins. Bitcoin Cash Hardforks On May 15th. What Does It Mean For BCH Owners? On May 15, 2018, Bitcoin Cash (BCH) blockchain will undergo a network upgrade that will implement some drastic changes to its underlying protocols. Here’s what you need to know. As part of our continuing efforts to improve our service, we’d like to know your thoughts on our weekly CoinSnacks newsletter. Coinbase, the U.S.-based cryptocurrency exchange startup, has publicly shared part of its response to (former) New York Attorney General Eric Schneiderman’s recent inquiry. In stark contrast to Kraken’s response, Coinbase’s chief legal and risk officer Mike Lempres wrote “We applaud the [Office of the Attorney General] for taking action to bring further transparency to the virtual currency markets,” in a five-page letter. Ethereum (ETH) was the subject of major scrutiny earlier this week – all revolving around fake news that U.S regulators were about to declare Ethereum a security or utility. The whole circus started on the 1st of May, when the Wall Street Journal first broke the news. AION (AION) is one of our favorite long-term projects as they’re working on interoperability and helping Ethereum scale. It has currently retraced just below the .236 to a strong support zone from previous price action. 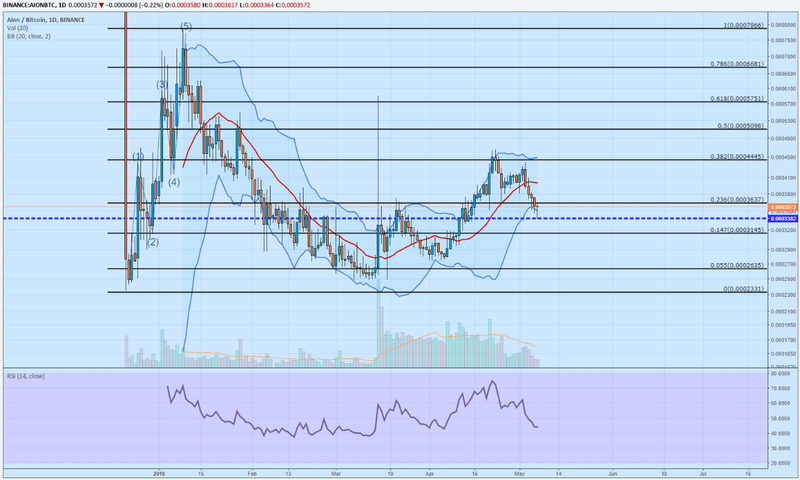 The RSI is starting to tick up on the daily and we believe this one has plenty of room for growth. 📌 The Crypto Crime Wave, EOS vs. ETH, and Your Chart of the Week!